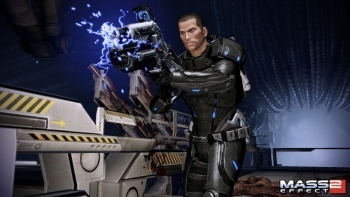 Signs point toward BioWare adding multiplayer to its popular sci-fi action-RPG Mass Effect. Videogame industry job listings rarely imply something as clearly as one of BioWare's latest. Caught by Games Blend, the supreme RPG developer is looking for a multiplayer programmer for the Mass Effect franchise. What makes us know this? A LinkedIn post by EA Senior Recruiter Jeff Goldstein is titled: "BioWare Montreal - Multiplayer Programmer (Mass Effect Franchise)." BioWare could plan to bring a new multiplayer mode to Mass Effect 3, though it could also be for an off-shoot in the franchise or something else too. BioWare Montreal is listed as the "newest member of the BioWare family" that is working on Mass Effect to "build [its] way toward becoming a fully self-sufficient BioWare studio." Multiplayer programmers there will "take existing single player user experiences and make them multiplayer safe." BioWare isn't really known for multiplayer, though its upcoming expensive MMORPG Star Wars: The Old Republic will probably bring a player or two together online. When it comes to Mass Effect, a traditionally single-player game, the wording would seem to indicate something like a co-op mode. Mass Effect deathmatch is always a possibility, considering how Mass Effect 2 had combat that was very Gears of War-like, but it makes much more sense to allow multiple players to join up on the same squad to take down baddies and gunships. The only issue I can see is: How will pause-and-play work when you can't pause? We should definitely keep an eye out to see what type of multiplayer gameplay Mass Effect could bring us in the future, whether it be in Mass Effect 3 or something unannounced.